Addis Ababa is the capital of Ethiopia and the seat of the African Union. Taking a stroll through the capital today, you may be entirely unaware of the extensive Armenian presence in the city during the modernization period of Ethiopia. Although Armenians and Ethiopians share a long history as members of the same branch of Orthodox Christianity, there is a lesser-known story regarding the contributions of Armenians in Addis Ababa and how they transformed a newly born agricultural town into a thriving capital of culture and commerce. During the early 1900s, under the rule of Emperor Menelik II, there were approximately 50 Armenians in Addis Ababa. But the size of the community would soon grow tremendously and flourish with the turn of the century under Haile Selassie’s rule. Known by his official name, Tafari Makonnen Woldemikael, Haile Selassie was Ethiopia’s head of state from 1916 to 1930 and Emperor from 1930 to 1974. His life and legacy carry a fundamental role in African and Ethiopian history as well as in the Rastafari movement. 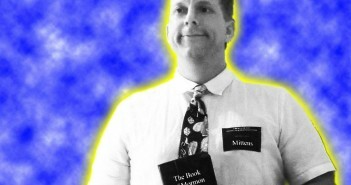 In the case of the latter, he is considered a messianic and holy figure. In fact, the African-Jamaican spiritual ideology known as Rastafari gets its name from the imperial title of “Ras,” and Tafari — Selassie’s first name. After becoming the regent and de facto ruler of Ethiopia in 1916, Selassie began to gradually modernize Ethiopia, beginning with the capital, Addis Ababa. He started by having Ethiopia admitted to the League of Nations in 1923 and his diplomatic trips in the following years aimed to solidify stable connections outside of Ethiopia. The first of these diplomatic visits was in 1924, when Selassie went on a trip to Europe and the Middle East in the hopes of establishing allies in Europe. But it was in the heart of the Middle East — in Jerusalem — that Selassie would soon become acquainted with the 40 Armenian orphans who would ultimately become the forerunners in the modernization of mainstream music in Ethiopia. As Selassie toured Jerusalem, he visited the Armenian Quarter and marveled at the St. James Armenian Apostolic Church (Surb Hakobyants Vank.’) Selassie himself was a devout member of the Ethiopian Orthodox Church and he noted the striking similarities between the two churches, as well as the likeness in written script. More significantly, however, it was on this day, as he was walking through the Armenian Quarter of Jerusalem, that Selassie observed a marching band composed of 40 young Armenian men; he was deeply moved by the band’s musical talent. After concluding his tour of the Armenian Church and district, Selassie had a conversation with Patriarch Turyan and learned that these 40 talented young musicians were orphans of the Armenian Genocide. He also learned of the terrible financial strain that came with raising these orphans. In response, Selassie offered to adopt and bring the marching band back with him to Addis Ababa. The Arba Lijoch, photographed by Haigaz Boyajian, royal photographer of Ethiopia. The Arba Lijoch formed the royal imperial brass band of Ethiopia and each of the children were allocated a monthly stipend, provided with housing and trained by their musical director, Kevork Nalbandian. Nalbandian was an Armenian orphan himself, originally from Aintab (modern-day Gaziantep) in the southeastern region of the Ottoman Turkish Empire. It was Nalbandian who led the Arba Lijoch with his musical compositions and Selassie was so impressed with the band’s compilations, he asked Nalbandian to compose the music for Ethiopia’s national anthem. In 1926, Nalbandian composed the Ethiopian Imperial National Anthem titled, “Teferi Marsh, Ethiopia Hoy,” which translates to “Ethiopia, be happy” and it was performed by the 40 orphans for the first time in public during Haile Selassie’s official crowning as Emperor on November 2, 1930 in Addis Ababa. A recent project by Silva Sevlian, which was conducted during her time at the University of Southern California, documents the experience of the Armenian community in Addis Ababa at that time. Included in these documents is an oral account of an Armenian who witnessed one of the anniversaries of the coronation in the late 1950s. Aslanian wasn’t the only Armenian that Selassie had made an impact on. In fact, Selassie’s initial coronation on November 2, 1930 set a defining tone for the Arba Lijoch and the Armenian community in Ethiopia. The Arba Lijoch began performing for nearly every imperial event of the state, and later trained Ethiopia’s army and imperial bodyguard bands. These 40 orphans who were once deprived of their most earnest childhood memories due to genocide and dispossession had now found their beacon of hope through music. While not much is recorded about the personal lives of the 40 orphans, Mesfin Kebede, a native Ethiopian resident of Addis Ababa, possesses some documents that provide a look into the lives of the orphans, including their names, ages and hometowns. While Selassie gave these orphans the opportunity for a new life, the Arba Lijoch gave Ethiopia the opportunity to modernize its music. Through their brass instruments and widespread musical instruction, the 40 orphans forever changed the framework of mainstream music in Ethiopia. Though it’s undeniable that select brass instruments were eminent in intimate circles of musicians in Addis Ababa since the early 1900s, it’s widely agreed by Ethiopian and non-Ethiopian musicians and scholars that the Arba Lijoch was both directly and indirectly responsible for modernizing popular music in Ethiopia. Prior to the Arba Lijoch and Kevork Nalbandian, the prominent musical instruments in Ethiopia were mostly made of wood and string. For example, traditional Ethiopian folkloric music utilized ethnic instruments such as the ney and washint; similar to what the tsiranapogh (commonly known as duduk) instrument is to Armenian folk music. The replacement of wood and string instruments with brass instruments among popular music earned Arba Lijoch the prevalent recognition of being the pioneers of musical modernization in Ethiopia. This musical development in Ethiopia took place in two phases. First, the imperial brass band trained and lent support to the development of other modern music ensembles such as the army, police, and imperial bodyguard bands. Secondly, as the Arba Lijoch began performing among crowds during national events throughout the years, musicians began to prefer new brass instruments as opposed to the more traditional wood and string. The particular jazz-funk that the Yared periodical and Tilbian referenced was the emergence of a unique musical genre known as Ethiopian jazz (or, Ethio-jazz) that developed sometime in the mid-1950s and reached its peak in the late 1960s. During the initial years of Ethio-jazz, the first recording studio in Ethiopia was opened in 1952, by an Armenian musician named Garbis Haygazian. Haygazian, in collaboration with Kevork Nalbandian’s nephew, Nerses Nalbandian, would continue the tradition of Armenians in contemporary Ethiopian music by becoming founding fathers of this genre. Nerses carried Kevork’s musical legacy by becoming the musical director of the Haile Selassie National Theater in the 1950s, later composing the anthem for the African Union and, most importantly, influencing and training popular Ethiopian artists such as Mulatu Astatke. Among Ethiopian society today, Astatke is widely regarded as being the father of Ethio-jazz and evolving the orchestral brass band sounds of the Nalbandians to encompass jazz and funk tunes. His musical style incorporates a unique mix of Ethiopian melodic tunes through the medium of brass instruments. A story passed down to Tilbian by one of the last remaining members of the Arba Lijoch, tells us that it was customary for the Arba Lijoch to play the national anthem for visiting diplomats. One year, Selassie’s interior had summoned the orphans to learn the anthem of Turkey in preparation of the visit of Turkish delegates. All 40 orphans, in protest, refused to learn the anthem, saying “We will not learn the anthem of a country that killed our parents.” After much pleading from the Ethiopian interior, the Arba Lijoch eventually learned the anthem. But when the time came to perform it to the visiting delegates, the orphans performed an ethnic Armenian song instead. The plight of the Armenian orphans and residents of Addis Ababa was also well known to Selassie himself, for he lent special treatment to the Armenian community and believed in their good intentions towards Ethiopian society. Not only were the Armenians granted asylum, but they also had a special role within Ethiopia, which explains why the Armenians were the only ethnicity besides Ethiopians who were allowed to arrive to and depart from Ethiopia freely. In contrast, both Emperors Menelik II and Selassie often had doubts regarding their relations to other ethnicities and were generally weary of the possibility that the other ethnicities may attempt to colonize Ethiopia. Thus, the other ethnic minorities were forbidden to travel. In a varying viewpoint to the popular theories of Ethiopian modernization, Ethiopian scholar Milkias Paulos suggests that prior to the 1900s, association with business was looked down upon by Ethiopian society at large. Paulos thus postulates that this is the reason why most of Ethiopia’s early businessmen, musicians and other professionals were mostly composed of professionals who were ethnically Greek and Armenian. In his book Haile Selassie, Western Education and Political Revolution in Ethiopia, Paulos provides a demographic of the ethnic minorities in Ethiopia that highlights the Armenian community at its peak in 1935 with a population of 2,800, slightly under the Greeks and Arabs. Though the numbers of the Ethiopian Armenians were marginal in comparison to other ethnic minorities, it’s undeniable that the influence of the Armenian community at times surpassed that of other communities. Even when the Armenian community numbered less than two hundred in 1909, an Italian map printed during the same year made a specific note to highlight the Armenian quarter just north of the Ras Makonnen Bridge. The Armenian influence in Addis Ababa wasn’t just limited to the Arba Lijoch, but also encompassed various professional roles within a given society. 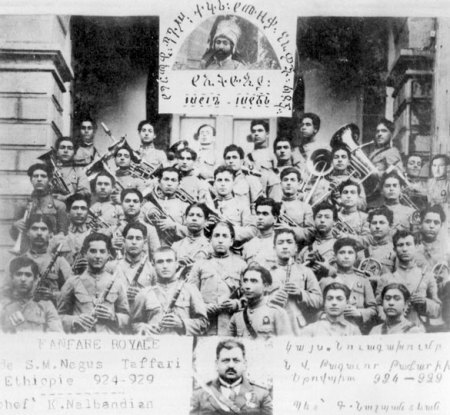 While the Armenian orphans led the wave of musical modernization in Ethiopia, the Armenian community in Addis Ababa also governed the pharmaceutical and medical institutions at the turn of the 20th century. Dr. Richard Pankhurst, a highly-renowned scholar of Ethiopian history, highlights figures such as the Devletian and Latifian families. He notes that Hovhanes Devletian was a native of the Van region and became Selassie’s personal physician, while the Latifians owned and managed the imperial pharmacy in Addis Ababa. This tradition of Armenian physicians and dentists is also present today: according to Kebede, one of the sons of the Arba Lijoch, Mesrop Sarkisian, is one of the most renowned dentists of Addis Ababa. In modern times, when scholars and historians research and engage in the historiography of modern Ethiopia, they often utilize the primary visual sources that are largely indebted to the work of Bedros Boyadjian. Boyadjian, born in Tigranakert (modern-day Diyarbakir), in the Ottoman Empire, became the first royal photographer of Ethiopia. Initially, he was the photographer of Menelik II, and later became the photographer for Selassie’s imperial court. Boyadjian was widely acclaimed for developing a talent for photography that was different from the norm at the time. Almost defiantly, he incorporated female and male subjects in one sitting frame and habitually cropped and montaged photographs to depict his royal subjects in the most optimal way possible — a practice that was almost non-existent in Ethiopian royal photography prior to Boyadjian. Queen Menen and Emperor Haile Selassie, photographed by Haigaz Boyadjian. Engineering and city planning were also industries that Armenians in Ethiopia thrived in, with the most notable contributors being Krikor Howyan and Minas Kherbekian. Howyan was born in Constantinople, graduated from the prestigious Ecole Nationale University in Paris with a degree in mathematics, and later published many scientific studies. Most notably, however, he was the chief engineer of Addis Ababa and built many bridges throughout the capital, as well as one of Addis Ababa’s most well-known historic hotels: the Itegue. Even before Haile Selassie assumed the position of emperor, Howyan had already established the first modern astronomical observatory in Addis Ababa in the imperial palace of Menelik. He also assumed an official position in the Astronomical Society of France (Société Astronomique de France) through the assistance of established networks throughout Europe. Howyan studied the constellations, meteors, and planets as seen from Addis Ababa and communicated his discoveries with the Astronomical Society of France on behalf of Ethiopia. When he wasn’t serving the Ethiopian royalty, he focused his attention on the small but thriving Armenian community in Addis Ababa. For example, Howyan constructed the first Armenian school in the country’s capital, in which Amharic, Armenian, English, and French languages were taught. 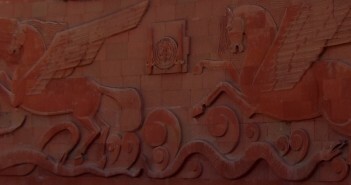 The state-of-the-art school also included a gymnasium and a sports club named “Arax” after the Araxes River of the historic Armenian Highlands. And in 1943, a second sporting branch was opened, called the “Ararat Sporting Association.” A couple years prior to his death, Howyan split his will three ways: partly to his immediate family, partly to the Armenian community in Addis Ababa and partly to the newly established Armenian Republic. Working under the patronage of Howyan was Minas Kherbekian, or better known by his nickname in Amharic, Betafras Minas, which translates to “Minas the house-crusher.” Kherbekian became to Addis Ababa what Haussmann was to Paris. According to accounts of the time, Kherbekian would walk around the city with a pointing stick and single out the structures in Addis Ababa that he deemed necessary for renovation or demolition. In their place, Kherbekian built new houses and institutions that incorporated traditional aesthetic motifs of Armenian, Arab, Italian and Ethiopian architecture to create unique structures. Despite being frequently met with opposition and skepticism, Kherbekian remained devoted to his plans of modernization and a vision of an urban capital that was suitable for the 20th century. Most of Kherbekian’s constructions can still be seen in the capital today and are currently being renovated as part of an effort to preserve old Addis Ababa. Additionally, one of the buildings that Kherbekian had designed and built is one of Addis Ababa’s most well-known tourist attractions called the Mohammedaly house. During Kherbekian’s time, the Mohammedaly institution was the largest importing and exporting trade firm, and he was commissioned to construct the central headquarters. Today, the Armenian influence of Kherbekian’s distinguished design of the Mohammedaly house is most prominently evident in the pillared staircases with triangular designs. On the other hand, the residential structures of Kherbekian include intricately detailed balconies, which encircle the upper floors of his buildings. These two styles of infrastructure carry exemplary designs of architecture that can be traced to cities with long-standing Armenian cultural and historical backgrounds, such as Gyumri or Shushi. While Howyan translated the visual poetry of the heavens into scientific studies and Kherbekian focused on infrastructure, their countryman Haig Patapan occupied himself with the intellectual realm. The extensive historiography of Armenian-Ethiopian relations is widely documented, thanks to Patapan’s 400-page text that was published in 1930 on the Armenian island of San Lazzaro in Venice, Italy. When he wasn’t translating the philosophical works of Friedrich Nietzsche into Armenian and Amharic, Patapan focused his attention on compiling encyclopedia-like texts about Ethiopian history. One account of Ethio-Armenian relations tells us a story of Kherbekian. Patapan documented that shortly prior to Selassie’s crowning, Kherbekian concluded the construction of one of the most advanced bridges in Addis Ababa. Society at large, including Emperor Menelik II, doubted the modern design of the bridge and determined that it would not be secure enough for heavy traffic. The Emperor asked the crowd, “What fool would cross this bridge?” Confidently, Kherbekian replied, “I will be that fool.” He quickly called upon his friend and industrialist Sarkis Terzian to bring his latest invention, the steamroller, which was the heaviest machinery in Addis Ababa at the time, to test the bridge. Kherbekian successfully maneuvered the steamroller across the bridge while the diverse communities of Addis Ababa watched at the other end with their breath held in anticipation. When Kherbekian reached the other side of the bridge, Emperor Menelik II made his way to Kherbekian with a grin and bowed to him out of respect. By the year 1935, the Armenian population in Addis Ababa was roughly estimated at a little over 2,000. The extensive labor and love that the Armenians of Addis Ababa put out in the years prior had already solidified their reputation in Ethiopian society and in the eyes of Haile Selassie. Additionally, it seemed that Selassie had Armenian acquaintances outside of Ethiopia as well. For example, while Ethio-jazz was booming in the country’s capital in the 1950s, Selassie took a tour of the United States and had several meetings in San Francisco, California. Armenian entrepreneur and philanthropist George Mardikian frequented Selassie during his stay in the Bay Area with boxes of Armenian halva (a sunflower-seed-based candy). For the Arba Lijoch, Ethiopia not only became an asylum from genocide, but a place to thrive artistically and professionally, in the mold of Howyan and Kherbekian before them. As thanks for the opportunity, these “diligent, abstemious, and honest” Armenians left their enduring mark on the history of Ethiopia and its rich culture. I thought Ani had written this article with the most precious touch of grace … what a talent. I had a classmate by that same name and spelling, in Addis, and I wonder if the two Anis are related in any way. Rather than praising this masterpiece at no end, I want to express the warmest gratitude to Ani, for reviving such an epic episode in our community’s history, that seemed to be doomed to oblivion … thank you my dear, shad abris! Leí con mucho detenimiento esta historia, increíblemente hermosa y fantástica, que nos hace creer en la bondad del ser humano y en tener fe, porque a pesar de todos los males siempre hay una esperanza en la vida. Well hello Alan, and how nice of you to have sought for what could have been your own roots, being dispersed from the great tragedies into the four corners of the world map. We actually had 3 unrelated Terzian families in Addis, originally from totally different parts of modern Turkey, and the elder you met was probably Avedis Terzian, who regretfully passed away soon after your last visit. As for me, I currently live in Sweden since 2007, although I was in Addis between 2002 and 2006, after 30 years that I hadn’t set foot in my native country, due to the revolution that made most of us seek a different “home”. Too bad we didn’t meet then, but I am delighted to meet you here in cyberspace! There was a certain Arsen Adjemian who came to Ethiopia, via Marseille, in the 1950s. He was initially Director of the Kevorkoff Armenian School in Addis Ababa. He later stayed on as a teacher at the same institution for many years. He retired and stayed on in Addis Ababa till he died. He was an ardent Armenian – he instilled that sense of being Armenian in his young students through his lessons of Armenian history and literature. He was a batchelor and kept to himself. He read extensively. He was a poet. His poems were published in three volumes in the 1960s. 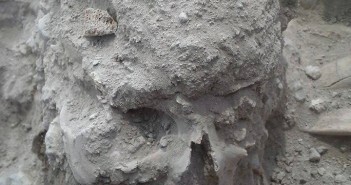 Some of the information and dates you are giving about “Avedis” Adjemian seem to be similar or close to those of Arsen Adjemian. Do you have the correct first name? Great historic article Ani. Many many thanks to you from the young generation Ethiopian. Thanks for connecting us in history and my hat’s off to the great Armenian people who gave much to Ethiopian in many ways. Hope to read more and pass the historic reality to generation next. I am in agreement. It was well written and thoughtful and considerate to all people mentioned. I am Iranian Armenian and Would like to know if there are any Armenian community still live in Ethiopia? I’ve always looked at the Amharic alphabet and noticed that many of the letters look nearly identical to the Armenian alphabet. That made me assume that the connection between Armenians and Ethiopians dated much further back than the 20th century. Do you have any information about the linguistic and alphabet similarities between the 2 languages? Lebanese-Armenian philologist Armenak Yeghiayan has written a volume regarding the Ethiopian origins of the Armenian alphabet, Mesropian tareru akunqnere (The Sources of the Mesropian Letters), Antelias (Lebanon), 2005. Thanks for this valuable information, Yervant. I didn’t know. There are many historical mistakes in this article, wrong dates, wrong names. for example The Yared Music School was a gift to the Ethiopian people by the Goverment of Bugaria. The first music proff. were Nersess Nalbandian, Azad Topalian, Ashken Mouradian. The Ethiopian Armenian History is very old, rich and long. before the Arba orphans. Armenians were already in Ethiopia during the crusaders, so it takes a real hitorian to do the homwork for many years with research and interviews with Ethio Armenians who live now outside of Ethiopia, plus check archives if there are any!!! As a layperson and not a “real historian”, I can’t speak to the historical inaccuracies that you mention re the gifting of the school and its first professors. I can however note the importance of recognizing the limitations, both spatial and rhetorical, of this particular forum. The audience is not a cabal of historians niggling over the authenticity of individual facts. That’s not to say accuracy isn’t important or indeed desired, but at this stage a perfect account is far from the main objective. It’s clear that the author was diligent in her research and interviews and, moreover, successful in the primary task of piquing a general interest and lifting the topic out of the mire of the esoteric, where it seems you would have it consigned. The condescension you employ (see again: “real historian”) is unnecessarily combative and unscholarly and undermines any productive criticism you may have had. Although some important facts and personalities are not covered in this article, overall, Ani has done a good job bringing to life the history of the Armenian Community in Ethiopia. . Present and past members of the Ethiopian-Armenian Community would welcome works such as Ani’s and encourage others to write more on this small but somewhat historical Armenian Diaspora. One additional remark, during the 1930’s the Armenian Community was around 350 in number. At any given time, the number of Armenians in Ethiopia dis not exceed 1200. This is a great article, thoroughly researched and truly just a refreshing read! I am so proud of my heritage. I wish that I knew of my father’s side(he passed when I was 3 while living in Fresno, CA) as his parents both died in Armenia at early ages. God bless Ethiopia for its humanitarianism. Amazing job dear Ani , you make us proud of being Armenians from Ethiopia with positive contributions and legacy. I have no doubt that you are just only bringing out some of your tools and talent out of your “toolbox” and your research , contribution and work eventually will yield in furthering the scope of our knowledge and view about the details of the community. If Ani is provided with many documents, pictures, books , letters, notes and articles about this subject by all of us from Ethiopia, the possibility of reading her beautifully composed articles would be limitless. There were so many details that I did not know prior to reading her article . Thanks you much. Good job, Ani! You have written a great article. There may be some inaccuracies, however that in no way diminishes the importance and value of your work, as well as our gratitude to you. I am glad to see so many of your generation, both Yetovbahyes and others, interested in the history of our community. As we eagerly await Aramazt Kalayjian’s documentary “Tezeta,” we are delighted to read your wonderful article. Thank you! With the advent of Christianity, this relationship strengthened and the similarity of our alphabets can be a result of that, since there was a lot of contact between Ethiopian and Armenian clergymen, both in Jerusalem and Egypt. In most likelihood, Mesrob Mashtots used the Ethiopian alphabet to give shape to some of ours since the Ethiopian alphabet was in existence before he was born. I had written a research paper in 1985 about the relationship of the Armenians and Ethiopians throughout history. If you are interested to read it, please contact me and I will send it to you. To all armenians , Selamta yederesachew meaning peace upon to you all! Thanks for the author to have given the deserved recognition of our regrettable KIng H.I.M. He was the best leader not only for Ethiopia, for Africa but for the humanity as a whole. He was going to lead a great movement of Pan Africanism when he was sent inside enemies that were trained in USA , which later became the infamous president Mengistu Hailemariam who lead our country brutally under Communism and killed nearly 3 millions of Ethiopians. Since it has gone worse as we got a new pro albanian guy again supported by UK and Arab countries (used a yemeni passport ) which has led Ethiopia in the terrible situation of todays’: during King no ethiopians were immigrant today look around you , they are dying taking ocean to reach Libya , Yemen where they get killed for being christians and abused! Since the loss of the great King, the man who served his country and modernized it, we are today at the mercy of a mafia party called TPLF who is violating all aspect of HR and the 6% that support them as they are from one ethnic group are chanting growth. It is a disaster what Ethiopia is going through . I am so grateful to this author who is revealing the King’s true nature, a man of God , for which Ethiopians are not taught today!! Your article is a tool to educate even our youth and we shall distribute it around so they can pride in such a King. Today, armenians have left in majority but as we are Orthodox our bond is strong and I hope one day, once this regime is gone (Ethiopians are getting organized for it watch ecadforum.com for news in English on Ethiopia ) we hope we will be able to restaure that strong relation with Armenians and continue the King legacy. Blessings from an Ethiopian and The King H.I.M rest in peace. for the Mighty One has done great things for me— We are children of God, who give thanks to Saint-Mary for she not only gave us His only begotten son but she saved him from the swords running in the desert as God chose her to be the Mother of Humanity, and Her only begotten son, The Saviour of the world. Peace upon the children of God and we shall not cease praying and fasting for Ethiopia. Fascinating article! As an Ethiopian, I am very pleased to read a short account of the history of the Armenian community in Ethiopia as well as their contributions to the rich history and culture of our country. After reading this article, I am now pretty much motivated to know more about the longstanding Armenia-Ethiopia relations. Thank you! God bless Armenia, Holy and Orthodox, forever and ever, amen. Example of God’s power over evil (Turks). Praise the lord and strength to Ani, Armenians, and Etheopia. As to the armchair negative critique of this superb article,… Seriously? great article and the feedback on this post is nice to see. i was recently in DC and was also treated very kindly by Ethiopians, what generous people. I love the expressive presentation about Armenians so I am free from the hearsay. Thank you Ani for your research for your article. It is a credit to it that it has inspired so many comments! In the third illustration for the article Antranik Markarian is listed as a band member. I interviewed Mr Markarian in Sydney in 1993. He was a member of the Bodyguard Band until 1926. Subsequently, for the Ararat literary journal published in New York, I wrote a five page article on the Armenian-Ethiopian connection, with a focus on music. I’m happy to forward it as a PDF to anyone interested. It contains two unique and great photos of the Band from Mr Markarian personal album. Thank you Ani for your article. I was born in Ethiopia and my grandfather Harootuin Tovmassian was one of the 40 orphans. Sadly he passed away before I could document his first hand story of his transit from Van to Jerusalem and then to Addis Ababa. I have been trying without success to find a first hand account of the journey that any of the 40 orphans endured. Do you know of any such account. Oops, I meant to say that Hartoouin Tovmassian was my father. I notice you graduated from UCI, I am also in Irvine. I remember going to Addis Ababa in 1973 to see my aunt Sirvart Bablanian who was very active in the Armenian community. She was also an arts teacher in the Emperor’s palace. We visited Nazaret, Dire Dawa, and Harrar. Her husband, who had already passed away, was an officer who had come to Ethiopia to train the Imperial army. Aunt Sirvart had married him and moved from Cairo, Egypt to Ethiopia. I was born in Addis. In my youth I also traveled to Diri Dawa and Harar. I am trying to find first hand accounts of the orphans march from the Lake Van area. Does anyone know of such accounts? I am Iranian Armenian that I live in USA. I would like to know if there is any Armenian Community still lives in Ethiopia? Thank you for sharing the photo of Aunt Sirvart. I never had the opportunity to meet Uncle Hmayak. I would love to see more photos of the school and church in Addis Ababa. Congratulations on a great article Ani, it is wonderful to have some more information on a piece of history that has always fascinated me as a historian who has studied the Near East Christian Holocaust and as a fan of Ethiopian music from the 1960s. I am particularly interested in one interesting period that is not mentioned here – the Italian Invasion and occupation of the 1930s. What happened to the Arba Lijoch during that time? Also one of the defenders against the Italians was a Turkish General called Vehib (Wehib) Pasha, who had opposed the Genocide and was part of the 1919 Military Commission to punish those responsible. Was there any contact between Vehib and the Armenian citizens of Ethiopia at the time? Finally, Noric Dilanchian – I would be very interested to read your article and see and pictures from Mr Markarian. Once again, thank you for a fascinating article. This is a beautifully written article. Thank you very much for capturing the essence of my community of birth with such fidelity and accuracy. Truly commendable. It’s been a while since I have read such a long piece in one breath. Thank you so much, This article means a lot to my family, as Luther Aghnoghian was my great grandfather. Good read Ani. The Armenian culture is very rich. It’s wells of history run deep. Teaching myself a little conversational Armenian. My dance studio family being in a prominent community I affectionately call Armenia USA. Truth is I feel a strong connection – kinship. Being a Jewish convert I also see striking similarities between ancient Israeli and Armenian history and culture. Hope to someday go to Armenia to explore my theory further. Random question: Does anybody know of any mixed marriages between an Armenian person and an Ethiopian person? The two cultures seem so similar that there wouldn’t seem to be the same stigma attached to other mixed marriages…. Thank you for your sincerity, Emanuel. That is good to hear. Just out of curiosity: Were all of these couples living in Ethiopia, or were any of them living in diaspora? As you know, both communities have vast diaspora populations. Sad to say Sevan jan that after the 1974 revolution most white indigenous left fled the turmoil and never came back. It’s worth mentioning that Italians had even more mixed marriages than us, and they too fled the country never to come back, and to this day they call it “il mal s’Africa” to indicate that once you’re touched by their affection, it’s almost like a disease that never leaves you! In answer to your question, you’ll find most of them in the diaspora, spread all over the world, but you’ll still find a dozen or so Armenians who are still in the Country as Ethiopians! I met one of them here in Stockholm, as white as snow, with as typical an Armenian first/last name as we come … who doesn’t speak one word of Armenian, Ethiopians here view him as an Ethiopian, because he thinks 100% like an Ethiopian … he’s an extreme, granted, but there you have it. Thank you, Emanuel! Very interesting. Miss Aslanian, have you ever think to give a resume of Arba Lijoch story to Steven Zaillian? I remember read that he was looking for an “armenian Schindler”. Please, think about it. It was an amazing and well researched piece, Dear Ani! My mom used to tell me of Armenians as honest, intelligent and business minded. I believe their contribution was of paramount importance to the my society as a whole. Thanks to the emperor who happen to forge the two nations’ historical relationship. I sense the usual ‘European pride’ in this article. To assume that the King of Ethiopia brought 40 adopted kids to civilize his nation is absurd. The king was one of the few emperors who had true allies all over Europe and the Middle East and could have easily found other ways if his intentions were solely modernizing Ethiopian music. This article hugely undermines the history and rich musical culture of Ethiopia that dates back to 3000 years and also undermines the fact that this god-fearing emperor wanted to protect other orthodox christians through charitable work. I sensed the usual ‘we did it for them’ approach of the west towards north and eastern African nations. In general, this article has put a dark curtain on the true intentions of Emperor Haileselassie when he adopted 40 orphaned Armenians. Be a bit humble and say it as it is ! do you know who is the first Christian country in the world? Not in Africa or in any given continent but the first Christian country in the world? No one can state that Ethiopian culture dates back to 3000 years, but it roots to almost 2000 years during the very Aksum time. This is already valuable enough. Non need to exaggerate or to dip into the mythical grounds. Be aware that ras T¨äfäri (he can’t be names Haylä Sellase at that time because not crowned yet) never adopted any of those “arba lidjoch”. They left Jerusalem with a contract, with a promise of salary (that was often forgotten by ras Täfäri), and they were supposed to be released from their job after reaching 18. Beside that story, no one can contest that Armenians, such as other nationalities, participated to the technological development of Ethiopia during the first half of the 20th century. Of course, most of them (even all of them) followed personal goal. In 1941 when the Emperor was entering Addis Ababa there was a problem of getting a record of Ethiopia’s national anthem. It is reported that none of the natives had it. Neither were there people who seem to understand the significance of the anthem which never ever was sung by BBC contrary to what they did for other exiled monarchs. At the last it was reported that an Armenian had a copy of the record which was kept hidden from the colonial rulers during the invasion. That was used while the Emperor was being welcomed to Addis Ababa on May 5/1941. Who was this Armenian who kept the record? There were other Armenian children..Babichief..and his brother from Adwa. They were of mixed parents, i.e. an Ethiopian Mother and an Armenian father. They were of the first group of youth who were recruited to be trained abroad by Ras Teferi (later Emperor Haile Selassie). 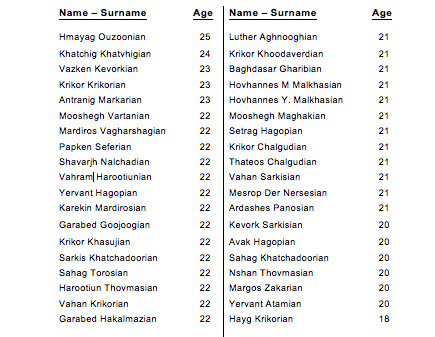 Do you have any information about the lives and contributions of these and other Armenian youth? I have read some from Military sources, and a few from historians. In 1986 when I was on a humanitarian assistance agency visit to Ethiopia responding to the effects of the drought, on a weekend in Addis Ababa I had the privilege of meeting businessman Vartkes Nalbandian and his sister pharmacist Hermine. My agency’s office was on Bole Road directly across from the Nalbandian Pharmacy. Vartkes and Hermine shared with me the history of their family in Ethiopia. Hermine, bless her soul, has since passed away. Vartkes has remained in Ethiopia as a pillar of Ethiopia’s Armenian and Ethio-Armenian community,The following website link provides an informative story on the history of Armenians in Ethiopia, in which is included a statement on the role of Kevork Nalbandian in respect to Ethiopia’s National Anthem. I am not a historian, but I find the national anthem reference in this link to be consistent with what I was told in person by Vartkes and Hermine. Dear Vartkes, if this message also reaches you, my appreciation once more for your kind hospitality when I first met you in 1986 and a visit again later. first thank you Ani for this interesting article. What a beautiful article. It is beautifully written! I for one didn’t know anything about the history of Armenians living in Ethiopia. I am very much impressed. Thank you for the informative history. I aa m Iranian Armenian and would like to know if there are still Armenian Community lives in Ethiopia? @ELL; Yes, There are still Armenian community lives in Addis Ababa, Ethiopia. There are an Armenian School and Church around RAS MEKONNEN Bridge. Please, welcome to visit.